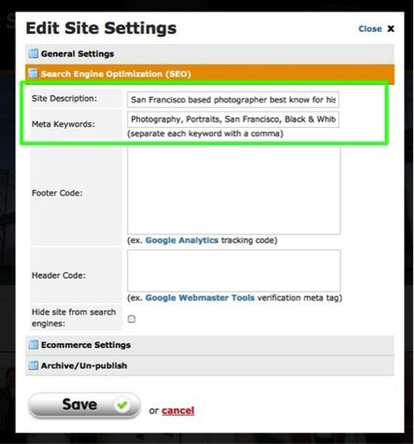 Every site has a place for you to enter Keywords and a Description for your site. These can be found under Settings > Search Engine Optimization. Both of these fields help search engines to categorize your site. And the Description is what will actually be displayed as the description for your site in your search engine listings. "Flowers and Such is a professional florist in Tuscaloosa, AL with 25 years’ experience making birthdays a little brighter and anniversaries a little rosier. We have roses, lilies, orchids, tulips and every other flower under the sun." The Keywords should be fairly targeted and also be the kind of words you use on your site. If your Keywords don't match your site content then they are practically useless. The imaginary florist we've written about above might want a list of Keywords like Flowers, Florist, Denver, Colorado, Birthdays, Anniversaries, Weddings, Apologize, Roses, Lilies, Orchids, Tulips. You may want to use around 20 or 30 words here that match your content and the types of searches people may do to find that content. 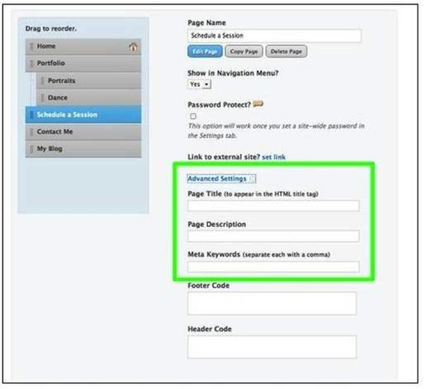 Learn How to Optimize Your Site for Search Engines.